Summer is here and school is out, which means an exciting new routine for some. For our family, however, it is business as usual. Matthew’s not in school yet, and we adults unfortunately don’t get that nostalgic summer break. We still plan on having fun though. Getting in a rut stinks. Ruts stink even more when they get in the way of our health goals. Doing the same exercise routine, eating the same healthy foods over and over can get old and feel stale. We need and deserve some adventure and excitement. Without it, we can lose motivation. We got to keep life interesting, that’s the whole point. I wonder how many times I have typed, “variety is key” in this blog?? Probably a lot. But it’s true. When it comes to food ruts, I can help you get creative. I encourage people to break through the stigma that being “healthy” is boring – that you have to eat boring, flavorless, “health” foods or that you have to suffer on a treadmill everyday. Nope and nope. What better way to get out of a rut than to jazz up the start of your day – at breakfast. There’s been some debate recently, but breakfast IS still the most important meal of the day. There’s just a catch now. It has to be made up of healthy protein and fiber for it to do you any good. If you eat a breakfast like that, you will be overall healthier, lose weight easier, and maintain a healthy weight better. Why would eating more in the morning help? Because you feel satisfied longer, crave less, have better blood sugar control, and have much more self-control by lunch than your no-breakfast-I’m-going-to-kill-you-Game-of-Thrones-style-over-that-last donut-self would be. 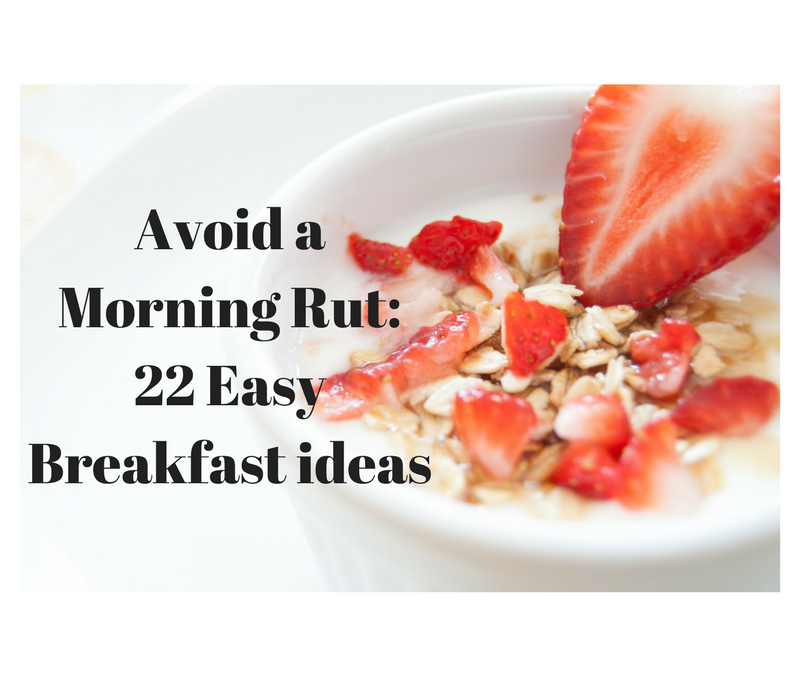 If you need breakfast ideas, check this out. It’s a mixture of hot and cold breakfast ideas, but they all meet that protein/fiber requirement. Try some of them out this summer to keep things interesting, and to keep on track. Scrambled eggs with black beans, diced onions and tomatoes on top of slice of whole grain toast. Strawberry Oat Smoothie-Strawberries, vanilla greek yogurt, 2 tablespoons of oats, and a pinch of unsweetened cocoa powder. Blend well. Avocado Toast – Mashed avocado spread on whole grain toast, drizzle with a little olive oil, lemon juice, and sprinkle lightly with salt or red pepper flakes for a kick. If you need extra protein, top with a fried egg. Homemade Egg “McMuffin” – Fried egg with cheese or Canadian bacon on a whole grain English muffin. Add a couple orange slices. Whole grain waffle with peanut butter- Opt for peanut butter instead of syrup to cut down on sugar and boost your protein. Can top with dried fruit. Morning “Pizza” – Top a slice of crunchy bread with 3 tablespoons low-fat ricotta cheese, tomatoes, and a little drizzle of olive oil, salt and pepper. Can broil in the oven for a hot treat. Energy Bars – Check labels for sugar content and try to get one with more protein. Odwalla, Kashi, GoLean are some options. “Portable cereal” – Mix your favorite whole grain cereal with vanilla yogurt instead of milk for less spillage when traveling. Throw in some berries/dried fruit/nuts with it. Egg Taquito – Hardboiled or scrambled egg with a little cheese or Canadian bacon or lean ham, wrapped in a whole grain or corn tortilla. Add some salsa for a flavor punch. Quinoa Fruit Salad – Dress up strawberries and blueberries by sprinkling with a scoop of quinoa. Can dress with honey, lime juice, or even basil for a very sophisticated flavor. Breakfast Egg Muffins – Beat eggs, diced onions, tomatoes, bell pepper, maybe even some spinach together, and pour into a non-stick muffin tin. Sprinkle with a little cheese. Bake at 375 degrees for about 15-20 minutes or until tops are firm to touch. Peanut Butter Banana Smoothie – click the link for my specific recipe. French toast – Make it healthier by using whole grain bread of choice, and top with a protein source such as ricotta cheese instead of syrup. Have with fresh fruit. Egg, cheese, veggie omelet – Can get very creative here. I like to mix 2 eggs, diced bell peppers, onions, and tomatoes, with a sprinkle of cheese. Pair with fruit or a slice of whole grain bread. English Muffin Egg Pizzas – A hit with the kiddos. Toast whole grain English muffin halves on a baking sheet. Drizzle with a little olive oil, top with a couple hardboiled egg slices, a tomato slice, and grated mozzarella. Sprinkle with oregano and sea salt. Broil for about 5 minutes or until cheese melts. 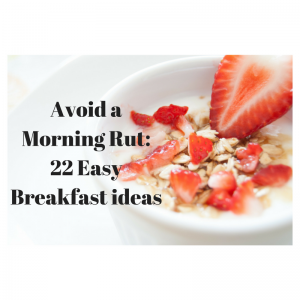 I hope this can help you get out of your breakfast rut. Here is a demonstration on how to enjoy a strawberry oat smoothie while doing squats. Two birds with one stone. One last thing before you go. If you live in the New Braunfels/San Marcos/SA area, I am having a class I’m super excited about next week, Thursday, June 16 at 6:30pm – Grocery Shopping Smarts and Label Reading! I will spend an hour providing you the tools to better navigate the sea of confusing food labels and come out of the store feeling empowered with smart choices, not guilt-laden ones. Check out www.food4success.com for more info on how to sign up!